I don't know why I'm admitting this — I hate admitting things like this — but I started listening to Arctic Monkeys because of the hype. I have a soft spot for British music and when I learned this band was setting records and taking the British music scene by storm I had to know what the fuss was all about. Whatever You Say I Am, That's What I'm Not didn't get released in the US until some months after it had been a certified smash in the UK, but I was there the day it hit our shores. I listened to the album a number of times and, in the end, felt the hype did more harm than good to their cause. Sure, the hype helped them sell a shitload of records. I bought the record as a result of it. The album didn't live up to the hype and I'm not sure it ever could. It is a good record, not an all-time classic. I was on the fence about whether I'd spring for Favourite Worst Nightmare, Arctic Monkeys' sophomore effort, having not felt fulfilled by the debut. I was leaning towards skipping it when an advance of the album appeared in my mailbox unexpectedly, unsolicited. The essential elements of the first record seem to be present on the follow-up disc. There is a hip hop-sensibility to Arctic Monkeys' sound, in particular the way Alex Turner spits his lyrics with rapid-fire delivery. I don't know if it's just my ears processing it or some studio trickery, but when he gets going it almost feels like every other word is coming alternately from the left or right speaker. His cadence and cool are in full, frenetic effect, and if you listen closely you'll find yourself cracking up at some of the deliciously-delivered one-liners. The music sounds like one of those splatter paintings you sometimes see in a museum. The artist moves fast and slings colors all over the canvas, and despite the appearance of complete chaos everything gets covered. This type of art is often best if you don't stop to stare, and the same can be said for the music on FWN. The playing sounds great, but the individual parts aren't anything special. The bass is boomy; the guitars churn, the drums are propulsive although often mixed low, and everything mastered preposterously loud. My only real knock against Whatever is that it was fun listening, but not memorable. Listening wasn't a chore but other than "View From the Afternoon" and "I Bet You Look Good on the Dancefloor," I couldn't remember a thing about what I'd just listened to. 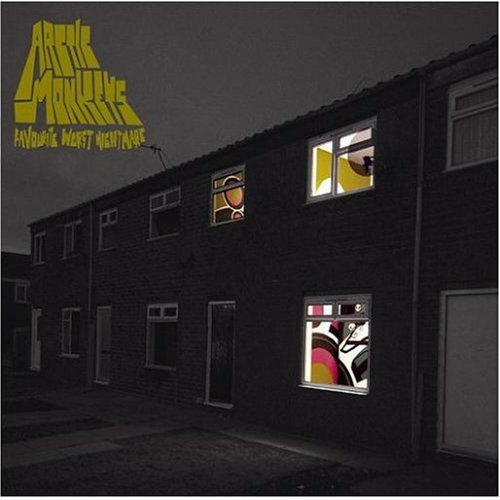 Favourite Worst Nightmare is a decided improvement in that regard. This album is fun, fast-paced, hooky, and loud. It lacks that single, or single song, that worms its way into your head for hours and days after you hear it, but has enough charisma when taken as a whole to bring you back for repeated listens. The Arctic Monkey are not strong on melody instead relying on energy, intensity, and fun. That I like this record is a reminder there is no single path to greatness or a proven formula for making good music. Favourite Worst Nightmare does what any second album should do: retains what was great about the debut and improves upon it.